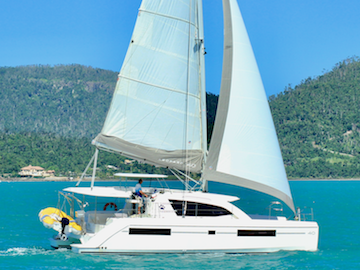 This brand new luxury 3 cabin Leopard 40 sailing catamaran is the latest design from Leopard Catamarans featuring the innovative forward saloon door, allowing foredeck access and great air-flow through the boat. She can accommodate up to 8; two bathrooms, three double cabins and one forward single bunk. The saloon table will also convert to a double. The rear cockpit has a large table with ample seating. The upstairs galley, generous refrigeration space and great ventilation provide for comfortable cruising. She will also perform equally well under power. Ideal for three couples, families and mixed groups and those who want the best. For easy sailing; she has a roller furling headsail and autopilot.